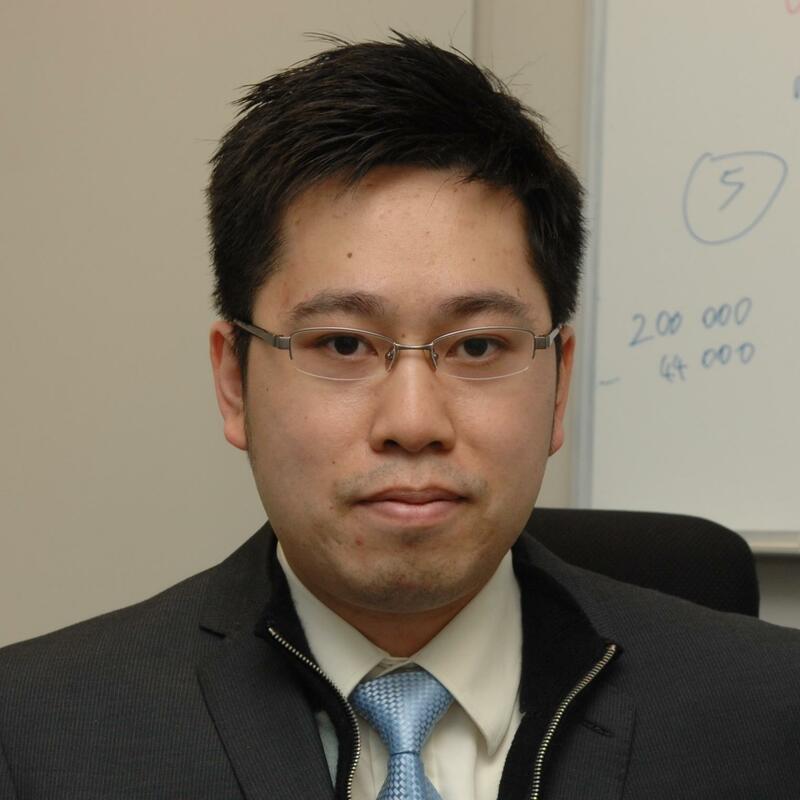 Ka-Chun finished his PhD degree in Department of Computer Science at University of Toronto (where modern AI was popularized in 2010s ) within 3.5 years (2012-13 departmental average: 6 years after master degree) by the end of 2014, after his RGC-funded MPhil degree. He is merited as the youngest associate editor as well as first ever outside USA and Germany for the open-peer-review journal, BioData Mining, in 2016. He is also on the editorial board of Applied Soft Computing since 2016. He was invited as the plenary/keynote speakers for ICBCB 2017, ISACIT 2018, DSIT 2019, and IC-LYCS 2019. In addition, he has solely edited 2 books published by Springer and CRC Press, attracting 30 peer-reviewed book chapters around the world (i.e. Argentina, Australia, Belgium, Brazil, China, Egypt, France, Germany, Hong Kong, India, Japan, Spain, amd USA). In 2017 and 2018, he has single-authored DNA motif informatics published on Bioinformatics and iScience with CityU affiliation, demonstarating solid examples for his PhD students at CityU. 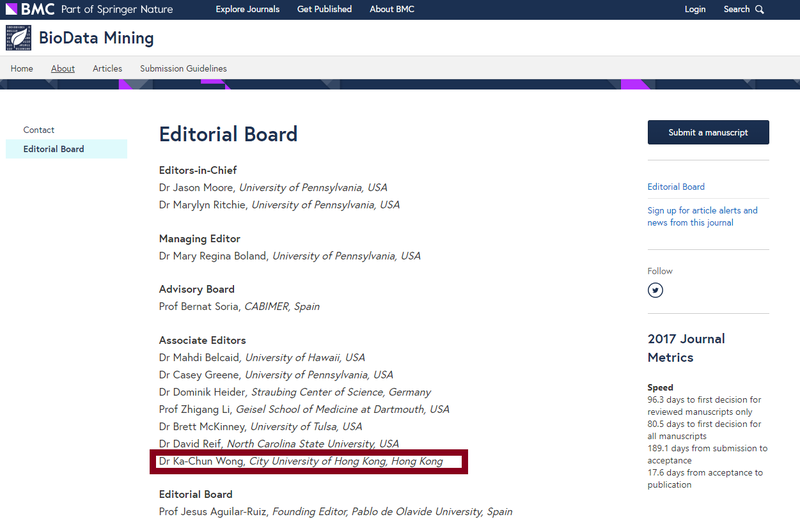 After that, he led his CityU team to pursue the direction further as published on Nucleic Acids Research (2017 IF=11.6) and iScience with CityU affiliation in 2019. Lastly, Ka-Chun explicitly showed his track records since the 2003 SARS outbreak below, encouraging all peer students under the Hong Kong education system to trust and embrace their dreams under diverse settings. 2019 “ACM Distinguished Speaker ” (2019-2022, 1st in Hong Kong), ACM, US. 2018 “General Research Fund” (57 out of 175 CS professors), RGC, Hong Kong. 2017 “General Research Fund” (56 out of 188 CS professors), RGC, Hong Kong. 2016 “Early Career Scheme” (Largest 2016 ECS in CS area), RGC, Hong Kong. 2015 “Assistant Professorship” CS, Cty University of Hong Kong. 2015 “Doctor of Philosophy” CS, University of Toronto. 2013 “Acres - Joseph Yonan Memorial Fellowship” CS, University of Toronto. 2012 “Kwok Sau Po Scholarship” SGS, University of Toronto. 2012 “Acres - Joseph Yonan Memorial Fellowship” CS, University of Toronto. 2011 “International PhD Funding Package” CCBR, University of Toronto. 2008 “RGC Postgraduate Studentship” The Chinese University of Hong Kong. 2007 “Dean List” Engineering, The Chinese University of Hong Kong. 2007 “Chiu Fuk San Prize” United College, The Chinese University of Hong Kong. 2005 “Multiple Scholarships for HK A-level” Concordia Lutheran School. 2004 “Championship ” Computer Game Concept Competition by Sha Tin IVE. 2003 “Multiple Scholarships for HKCEE” Concordia Lutheran School. Wenjun, Wang. , Shaoqiang, Yang. , Qiuzhen, Lin. , Qingfu, Zhang. , Ka-Chun, Wong. , Carlos A., Coello Coello. & Jianyong, Chen. (2019). An Effective Ensemble Framework for Multi-Objective Optimization. IEEE Transactions on Evolutionary Computation. Ka-Chun, Wong*. , Shankai, Yan. , Qiuzhen, Lin. , Xiangtao, Li. & Chengbin, Peng. (*Corresponding Authorship 2019). Deleterious Non-Synonymous Single Nucleotide Polymorphism Predictions on Human Transcription Factors. IEEE/ACM Transactions on Computational Biology and Bioinformatics. Shankai, Yan. & Ka-Chun, Wong*. (*Corresponding Authorship 2019). GESgnExt: Gene Expression Signature Extraction and Meta-analysis on Gene Expression Omnibus. IEEE Journal of Biomedical and Health Informatics. Ka-Chun, Wong*. , Jiecong, Lin. , Xiangtao, Li. , Qiuzhen, Lin. , Cheng, Liang. & You-Qiang, Song. (*Corresponding Authorship 2019). Heterodimeric DNA Motif Synthesis and Validations. Nucleic Acids Research. Yunhe, Wang. , Bo, Liu. , Zhiqiang, Ma. , Ka-Chun, Wong. & Xiangtao, Li. (2019). Nature-Inspired Multiobjective Cancer Subtype Diagnosis. IEEE Journal of Translational Engineering in Health and Medicine. Xiangtao, Li. & Ka-Chun, Wong*. (*Corresponding Authorship 2019). Nature-Inspired Multiobjective Epistasis Elucidation from Genome-Wide Association Studies. IEEE/ACM Transactions on Computational Biology and Bioinformatics. Xiangtao, Li. & Ka-Chun, Wong*. (*Corresponding Authorship 2019). Single-Cell RNA-seq Data Interpretation by Evolutionary Multiobjective Clustering. IEEE/ACM Transactions on Computational Biology and Bioinformatics. Xiangtao, Li. , Shixiong, Zhang. & Ka-Chun, Wong*. (*Corresponding Authorship 2019). Single-cell RNA-seq Interpretations using Evolutionary Multiobjective Ensemble Pruning. Bioinformatics. Shixiong, Zhang. , Xiangtao, Li. , Qiuzhen, Lin. & Ka-Chun, Wong*. (*Corresponding Authorship 2019). Synergizing CRISPR/Cas9 Off-Target Predictions for Ensemble Insights and Practical Applications. Bioinformatics. Qiuzhen, Lin. , Songbai, Liu. , Ka-Chun, Wong. , Carlos, Coello Coello. , Jianyong, Chen. & Jun, Zhang. (2018). A Clustering-based Evolutionary Algorithm for Manyobjective Optimization Problems. IEEE Transactions on Evolutionary Computation (Accepted). Xiangtao, Li. & Ka-Chun, Wong*. (*Corresponding Authorship 2018). A Comparative Study for Identifying the Chromosome-Wide Spatial Clusters from High-Throughput Chromatin Conformation Capture data. IEEE/ACM Transactions on Computational Biology and Bioinformatics. Qiuzhen, Lin. , Genmiao, Jin. , Yueping, Ma. , Ka-Chun, Wong. , Carlos A., Coello Coello. , Jianqiang, Li. , Jianyong, Chen. & Jun, Zhang. (2018). A Diversity-Enhanced Resource Allocation Strategy for Decomposition-based Multiobjective Evolutionary Algorithm. IEEE Transactions on Cybernetics (Accepted). Laizhong, Cui. , Genghui, Li. , Zexuan, Zhu. , Qiuzhen, Lin. , Ka-Chun, Wong. , Jianyong, Chen. , Nan, Lu. & Jian, Lu. (2018). Adaptive Multiple-Elites-Guided Composite Differential Evolution Algorithm with a Shift Mechanism. Information Sciences (Accepted). Qiuzhen, Lin. , Yueping, Ma. , Jianyong, Chen. , Qingling, Zhu. , Carlos A., Coello Coello. , Ka-Chun, Wong. & Fei, Chen. (2018). An Adaptive Immune-inspired Multi-objective Algorithm with Multiple Differential Evolution Strategies. Information Sciences. Wenjun, Wang. , Shaoqiang, Yang. , Qiuzhen, Lin. , Qingfu, Zhang. , Ka-Chun, Wong. , Coello Coello, Carlos. & Jianyong, Chen. (2018). An Effective Ensemble Framework for Multiobjective Optimization. IEEE Transactions on Evolutionary Computation (Accepted). Qingling, Zhu. , Qiuzhen, Lin. , Weineng, Chen. , Ka-Chun, Wong. , A. Coello, Coello. , Jianyong, Chen. & Jun, Zhang. (2018). An External Archive-Guided Multi-objective Particle Swarm Optimization Algorithm. IEEE Transactions on Cybernetics (Accepted). Xiangtao, Li. & Ka-Chun, Wong*. (*Corresponding Authership 2018). Elucidating Genome-Wide Protein-RNA Interactions using Differential Evolution. IEEE/ACM Transactions on Computational Biology and Bioinformatics. Xiangtao, Li. & Ka-Chun, Wong*. (*Corresponding Authorship 2018). Evolutionary Multi-objective Clustering and Its Applications to Patient Stratification. IEEE Transactions on Cybernetics. Wei, Sun. , Yanquan, Zhang. , Ka-Chun, Wong. , Ken, Liu. , Yidong, Yang. , Bin, Wu. , Joanna, Tong. , Anthony, Chan. , Henry Lik-Yuen, Chan. & Jun, Yu*. (2018). Increased expression of GATA Zinc Finger Domain Containing 1 via gene amplification promotes liver cancer by directly inducing PRL3. Hepatology. Xiangtao, Li. & Ka-Chun, Wong*. (*Corresponding Authorship 2018). Multiobjective Patient Stratification using Evolutionary Multiobjective Optimization. IEEE Journal of Biomedical and Health Informatics (Accepted). Jiecong, Lin. & Ka-Chun, Wong*. (*Corresponding Authorship 2018). Off-target predictions in CRISPR-Cas9 gene editing using deep learning (ECCB 2018 Proceeding Special Issue). Bioinformatics. Jiao, Zhang. , Sam, Kwong. , Guangming, Liu. , Qiuzhen, Lin. & Ka-Chun, Wong*. (*Corresponding Authorship 2018). PathEmb: Random Walk based Document Embedding for Global Pathway Similarity Search. IEEE Journal of Biomedical and Health Informatics. Jiao, Zhang. , Sam, Kwong. & Ka-Chun, Wong*. (*Corresponding Authorship 2018). ToBio: Global Pathway Similarity Search based on Topological and Biological Features. IEEE/ACM Transactions on Computational Biology and Bioinformatics (Accepted). Junyi, Chen. , Shankai, Yan. & Ka-Chun, Wong*. (*Corresponding Authorship 2018). Verbal aggression detection on Twitter comments: convolutional neural network for short-text sentiment analysis. Neural Computing and Applications. Jun, Yu. , Lei, Cao. , Shiyan, Wang. , Yanquan, Zhang. , Ka-Chun, Wong. , Geicho, Nakatsu. , Xiaohong, Wang. , Sunny, Wong. & Jiafu, Ji. (2018). Zinc-finger protein 471 suppresses gastric cancer through transcriptionally repressing downstream oncogenic PLS3 and TFAP2A. Oncogene. Shankai, Yan. & Ka-Chun, Wong. (*Corresponding Authorship 2017). Elucidating high-dimensional cancer hallmark annotation via enriched ontology. Journal of Biomedical Informatics (Accepted). Xiangtao, Li. , Shijin, Ma. & Ka-Chun, Wong*. (*Corresponding Authorship 2017). Evolving Spatial Clusters of Genomic Regions from High-Throughput Chromatin Conformation Capture data. IEEE Transactions on NanoBioscience (Accepted). Ka-Chun, Wong*. (*Sole Authorship 2017). MotifHyades: Expectation Maximization for de novo DNA Motif Pair Discovery on Paired Sequences. Bioinformatics. Jiao, Zhang. , Sam, Kwong. , Yuheng, Jia. & Ka-Chun, Wong*. (*Corresponding Authorship 2017). NSSRF: global network similarity search with subgraph signatures and its applications. Bioinformatics. Qiuzhen, Lin. , Songbai, Liu. , Chaoyu, Tang. , Ruizhen, Song. , Jianyong, Chen. , Carlos A., Coello Coello. , Ka-Chun, Wong. & Jun, Zhang. (2017). Particle Swarm Optimization with A Balanceable Fitness Estimation for Many-objective Optimization Problems. IEEE Transactions on Evolutionary Computation (Accepted). Ka-Chun, Wong*. , Yue, Li. , Chengbin, Peng. , Alan M., Moses. & Zhaolei, Zhang*. (*Co-Corresponding Authorship 2015). Computational Learning on Specificity-Determining Residue-Nucleotide Interactions. Nucleic Acids Research. 43(21). 10180 - 10189. XIangtao, Li. & Ka-Chun, Wong. (2018). Natural Computing for Unsupervised Learning. Springer (New York). Ka-Chun, Wong. (2017). Big Data Analytics in Genomics. Springer (New York) [Content: 13 Peer-Reviewed Book Chapters with 46 Authors from Argentina, Brazil, China, France, Germany, Hong Kong, India, Japan, Spain, USA]. Ka-Chun, Wong. (2016). Computational Biology and Bioinformatics: Gene Regulation. CRC Press (Taylor & Francis Group) [Content: 17 Peer-Reviewed Book Chapters with 52 Authors from Australia, Belgium, Brazil, Egypt, Germany, Hong Kong, India, Japan, USA]. We always have positions available for graduate studies (PhD/MPhil) and postdoctoral fellows/scholars. Please send an email (with your CV and other supporting materials) to here if you are interested. Monthly stipend / salary is always provided for funded position. Hong Kong people do value cultural diversity. In the past 3 years (2015-2017), numerous PhD offers have already been given to students from Hong Kong, Mainland China, Parkistan, India, Canada, France, and UK. Applicants who do not need any finanical support and volunteers are also welcomed (reference letters could be provided if solid works are done). Please put down "Ka-Chun Wong" as your potential supervisor in your applications; otherwise, your applications may not reach us. Thank you for your interest.